Distinguished guests, ladies and gentlemen it is both an honour and a pleasure to be asked to speak to you all today. General Sir John Monash was truly a great Australian. Arguably our greatest military commander – I would certainly argue it. An accomplished engineer, a talented musician and eventually a highly successful businessman. He was complex and passionate. He had his personal flaws and relationship difficulties as we all do. He was proudly Jewish in an age and nation where it was not to one’s advantage to be so. Despite this, his intellect, his ambition, his innovation and his astonishing competence allowed him to rise above prejudice and racism and enrich our nation to this very day with contributions that we still come here to honour. According to the author Colin McInnes - Monash’s own presence and prestige, 'made anti-Semitism, as a “respectable” attitude, impossible in Australia'. God knows our modern society would do better to follow suit and judge the man rather than impose the stereotype – but then there are few men of Monash’s qualities that can convince humanity to put aside prejudice. 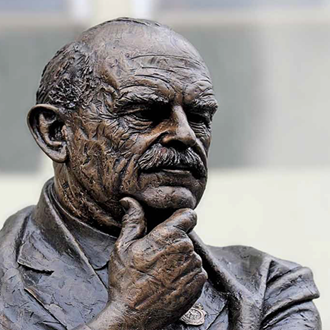 John Monash was born in Melbourne in 1865, educated at Scotch College and then the University of Melbourne – his university education was not a smooth passage. While he hugely valued scholarship he was equally enamoured of the more social aspects of a young university student’s life and was also distracted by the necessity of having to earn money to support both his education and family. Notably, he started as an arts student and ended up with bachelor degrees in both engineering and law. From personal experience, I can attest that it usually goes the other way around – you start with the sciences and end up an artist. At an early stage he began applying his academic knowledge to improve both his business and military outcomes. He brought his engineering and mathematical skills into the science of gunnery by designing and constructing an artillery training gun that revolutionised the way the coastal artillery trained. He wrote a treatise called a hundred tips for company commanders which became required reading for all those who followed. From early on in both of his careers he had an excellent rapport with people – up, down and across. Most were captured by his passion and commitment. His effect on people was well described by the chief technical advisor Hyman Herman in the State Electricity Commission, who stated; 'he was a great leader and a genius in getting to the heart of any problem and finding its solution … the ablest, biggest-minded and biggest-hearted man i have ever known'. Those that got to know and understand him remained supporters for life. By 1914, he had in civilian life established himself as a pillar of Melbourne society, lecturing and examining in engineering at university. Involved in a wide range of community activities including the boy scouts, and a number of prominent appointments such as chairman of the graduates association, president of the university club and Victorian Institute of Engineers. With the outbreak of war, Monash got off to a slow start taking on roles in intelligence and then briefly as a chief censor. Eventually his worth shone through and he was appointed as commander of the 4th infantry brigade and then promoted to the rank of brigadier. His brigade trained in Egypt and subsequently landed at Gallipoli on the morning of the 26th April 1915. The brigade was involved in a number of significant actions and suffered heavy casualties before it was pulled back to Egypt in early December. Around this time and throughout the remainder of his military career Monash was continuously subjected to whispering campaigns launched by those less than fond of him. These ranged from false accusations that he was born and educated in Germany, to claims he spoke poor English, all the way to rumours that he had been shot as a spy. Despite these retrograde efforts by detractors, Monash was promoted to Major General in July 1916, and placed in command of the 3rd Australian division. The division was involved in months of serious fighting and trench warfare in France from November 1916 until they progressed to full scale operations from June 1917 onward. In June 1918 he was promoted to Lieutenant General and appointed as commander of the Australian Army Corps. It was during this period that he planned and directed a series of determined and effective actions commencing in July 1918 with the masterful and meticulously planned breach of the German line at the battle of Hamel. Eight thousand (8,000) synchronised troops supported by artillery, tanks and aircraft attacked Hamel at dawn on 4 July 1918. One thousand (1,000) of these were American soldiers, the first to be commanded in combat by another nation – much to the displeasure of us commander Pershing at the time. The battle had been planned to take 90 minutes. It was over in 93 with all objectives taken and over 1,500 German soldiers taken prisoner. The battle for Amiens came next - described by Ludendorff as the black day for the German army. Then came the penetration of the Hindenburg line by 5th October 1918 and the Germans sued for peace. Monash approached battles as he approached engineering projects in his civilian employment---by coordinating all the key elements in great detail. He encouraged a working environment in which innovation was expected and input demanded. Monash promoted professional debate and gave commanders freedom of action. Under his leadership, for the first time, all fighting elements and supporting services had a solid comprehension of each other’s operational methods and goals. They knew what they were doing and why they were doing it. As a military commander he was a man whose natural feeling was to serve first. He was deeply concerned and committed to the welfare and quite starkly in comparison to some of his peers and superiors, to the survival of the men under his command. Keenly conscious of not only the carnage of the western front but of the crippling impact of battlefield losses on Australian society, he acted with a sort of "ruthless compassion" when planning attacks. He sought to completely overwhelm the enemy, through precise organisation and detailed preparation ensuring that every advantage was offered to his own force with nothing left to chance. He institutionalized what we now routinely call joint and combined arms warfare and to this very day the Army’s major annual combined arms training activity is named exercise Hamel. After the armistice the war was far from over for John Monash. He was entrusted with the task of demobilising and repatriating the 180 thousand surviving Australian troops so that they might return to society as useful citizens after experiencing the horrors of war. He arranged for them to undergo training in the United Kingdom while the massive task of planning and executing demobilisation and transportation continued. He oversaw the convalescence and rehabilitation of those who had been wounded, and arranged for the return of the wives and children for those who had met and married war brides in the United Kingdom or France. He involved himself in the welfare of his men, understanding that having asked them to give him their all in combat, he was ever obligated to care for them when they had done so. Upon returning from the war, Monash’s energy enabled him to continue with his prominent community involvement and contribution to a number of organizations. Some of his appointments included: royal commissioner to investigate the police strike of 1923; head of the Victorian state electrical commission, membership of the Commonwealth Defence Council and the Walter and Eliza Hall institute; service as a Rhodes scholarship selector, as President of the Australian Association for the Advancement of Science and the Honorary Vice-chancellor of the University of Melbourne. He worked tirelessly for many community organisations and remained a significant influence on the life and affairs of his alma mater, Melbourne University. He became a popular and revered figure at many ex-service occasions. Notably, he also contributed to the establishment of the ANZAC Day ceremonies and the choice of design for the Shrine of Remembrance. His achievements were legion and his influence remarkable. This is the simple selfless philosophy that gave rise to one of our greatest citizens. All of us who aspire to any form of leadership can have no better example than General Sir John Monash. Major General Paul McLachlan enlisted in the Regular Australian Army in 1982 and graduated from the Royal Military College - Duntroon in 1985. He was assigned to the Royal Australian Artillery and initially served as a Troop Commander with the 1st Field Regiment in Brisbane and as Adjutant of the 8th/12th Medium Regiment in Sydney. Major General Paul McLachlan has completed a wide range of staff appointments including Staff Officer Grade Plans at Land Headquarters and Military Assistant to the Land Commander. In 2000, Major General Paul McLachlan served as the Commander of the Diplomatic Supplementation Staff - Honiara during the coup in the Solomon Islands. During this deployment, he coordinated the evacuation of Australian and other approved nationals and arranged military support to the initial peace negotiations between the combatants. Major General Paul McLachlan served as the Commanding Officer of the 8th/12th Medium Regiment in the 1st Brigade, Darwin over the period 2003 to 2004, after which he assumed the role of the Operations Officer at Headquarters 1st Division/ Deployable Joint Force Headquarters. Major General Paul McLachlan served in Baghdad as the Operations Officer in the Joint Task Force Headquarters, where he was promoted to Colonel in February 2006. 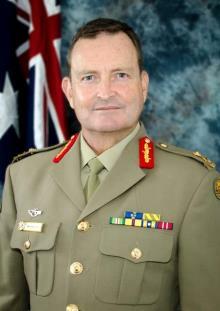 During the period 2006 to 2007, Major General Paul McLachlan was employed as the Chief of Staff at Headquarters 1st Division, located in Brisbane. He graduated from the Centre of Defence and Strategic Studies in 2008. Major General Paul McLachlan was appointed as Director General Development and Plans, at Army Headquarters in January 2009. He then assumed command of the Brisbane-based 7th Brigade in February 2010, where he was responsible for the force preparation of two Mentoring Task Force rotations into Afghanistan. During his tenure at the 7th Brigade, Major General Paul McLachlan led the introduction of brigade-level digitisation into the Army. In January 2011, Major General Paul McLachlan commanded Operation QUEENSLAND FLOOD ASSIST (Joint Task Force 637) during the Queensland flood response and recovery. He was awarded the Conspicuous Service cross for this role. In January 2013, he assumed the role of Head Land Systems at the-then Defence Materiel Organisation (now Capability and Sustainment Acquisition Group). In November 2015, Major General Paul McLachlan assumed command of the 1st Division and Deployable Joint Force Headquarters. Major General Paul McLachlan is a graduate of the Australian Defence Force School of Languages, where he was awarded a diploma in advanced Japanese in 1991. He also holds a Masters degree in Strategic Studies and recently completed a Diploma in Complex Strategic Procurement. He is also a graduate of the Harvard Business School Advanced Management Program.